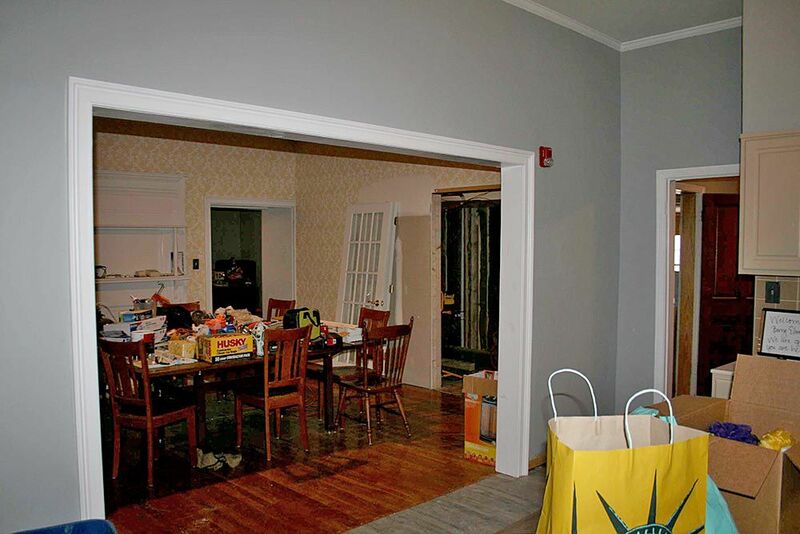 The William S. Davies Homeless Shelters Inc. has taken on two large projects in 2018, with both nearing completion as the New Year approaches. The first is the Ruth and Naomi Project, an all women’s shelter, which will be opening on North Broad Street by February, says Devon Smyth, executive director of both shelters. 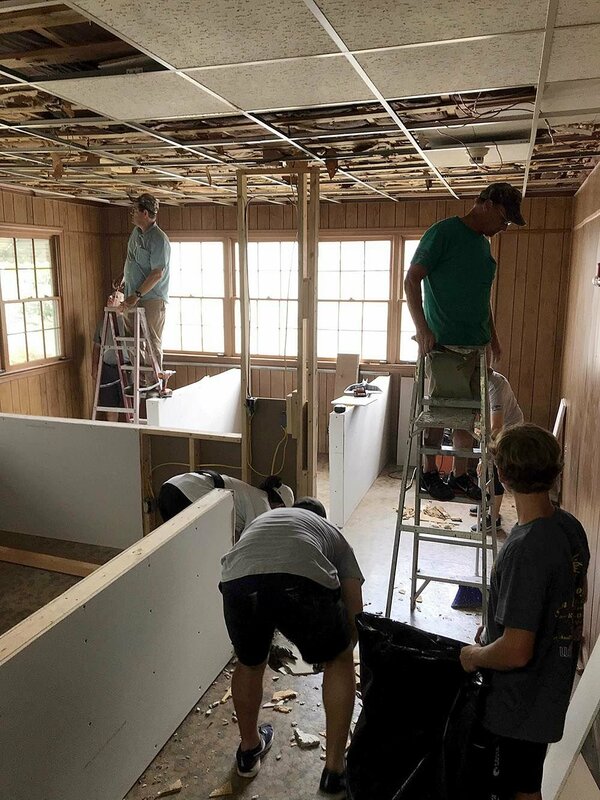 The project to update the Blue Ridge Area Health Education Center house has been underway since May, with over 700 community volunteers helping with the work according to Smyth. The house will be able to sleep eight single women and four women with kids all at the same time. The single women’s rooms are on the downstairs level of the house with four sharing a bedroom. Each woman will have a separate bed in the bedroom with low walls to give them some privacy. There is a fully functioning kitchen downstairs, a dining room and a living room that also functions as a play room for any kids living in the house. Also downstairs is the Merrill J. Davies Library, named after the wife of William S. Davies, which features two book shelves, a seating area and a computer lab. In the foyer of the house stands a Christmas tree decorated by Berry Elementary students with Christmas gifts set aside for future residents. Downstairs is also home to Smyth’s office, and a space for the night manager so someone is on hand for the residents 24/7. Upstairs is home to four large bedrooms set aside for displaced mothers with kids. Smyth said there is no cutoff on how many kids can be brought in as long as they are not over 17. Each upstairs bedroom has a key lock door to give the family privacy. Smyth said the mothers would be responsible for their own children during their stay. She added the shelter is still looking for new crib or pack and play donations. Smyth said the biggest challenge they faced was a recent one where she found out the state and city regulations on fire systems had changed and the almost 100-year-old house needed a sprinkler system. “Honestly the beautiful thing about the City of Rome and about this community is we put the word out four weeks ago saying, ‘Hey, we have got to do this,’ and we have all the money now,” she said. The city has approved the permit request for a new water main and, after the fees are paid, the project will get underway. Smyth said this is what pushed the opening back from the first of the year to the first of February. According to Smyth, the house was built sometime in the 1920-1930s. She said the house had good bones and they tried to stay true to it while at the same time making it comfortable for its future guests. Different parts of the renovation either came from donations or discounted costs from local companies. The Ball Corp. installed the upstairs flooring while Calhoun Restore sold the flooring at a big discount. Midian Roofing cut their cost for roof work and repair, members of Judge Colston’s drug court put up drywall and the Westminster Presbyterian ladies made curtains for the upstairs bedrooms, Smyth said. The second major project taken on by William S. Davies Homeless Shelters Inc. has been their work towards creating a farm off of South Broad Street using land donated by the City of Rome. The idea is to cultivate produce the shelter can sell to community members in order to provide them with healthy food as well as create jobs for those staying in the shelters. St. Mary’s School sold the Davies shelters a bus which they have outfitted to be a mobile farmers market. The bus will go into food-insecure neighborhoods to sell the food. The bus will also take SNAP dollars. Both the Ruth and Naomi Project women’s shelters as well as the William S. Davies men’s shelter both operate under the same umbrella company the William S. Davies Homeless Shelters Inc. To learn more about the shelters or for information on how to make donations visit daviesshelter.com or call Devon Smyth at 706-802-6300.